If you’re not aware by now, you sure should be that May is Ehlers-Danlos Syndrome Awareness Month. 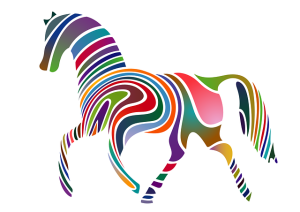 And you should also be aware that the zebra is our rare disease mascot. But, in case you weren’t aware, I’ll refresh the history behind it a little so as to explain myself. The saying goes that in medical school, doctors are trained upon hearing hoofbeats behind them, to think and diagnose the more common possibility, a horse so as to avoid over-diagnosing rare diseases. Needless to say, we turn out to be that less common occurrence, a “zebra” (in the western world), which helps explain the difficulty we experience getting diagnosed, as I’ve explained at length in About EDS and When to Suspect EDS. Naturally this leads us to sport lots of zebra themed attire and décor during May, but even all year round for the dedicated. This entry was posted in Uncategorized and tagged eds, Ehlers–Danlos syndrome, health on May 29, 2014 by Priya Ghose. Licensing Art….Relief For High S/H! JoAnnTomaselli on SAILING TO P-A-R-A-D-I-S-E!